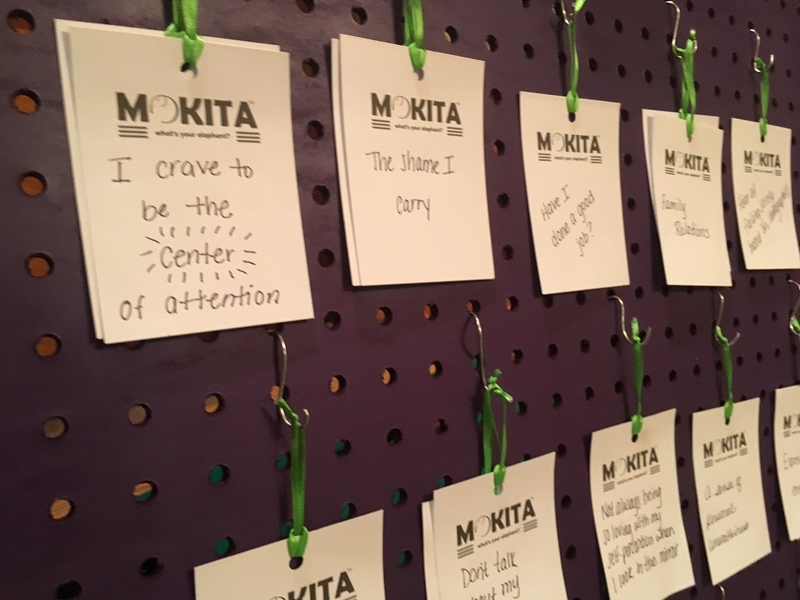 Mokita: A known truth left unspoken; think of it as elephant in the room. The word ‘Mokita’ comes from the language of Kilivila, spoken near Papua New Guinnea. ‘Mo’ is our mascot and travels around the Centre Region and beyond! 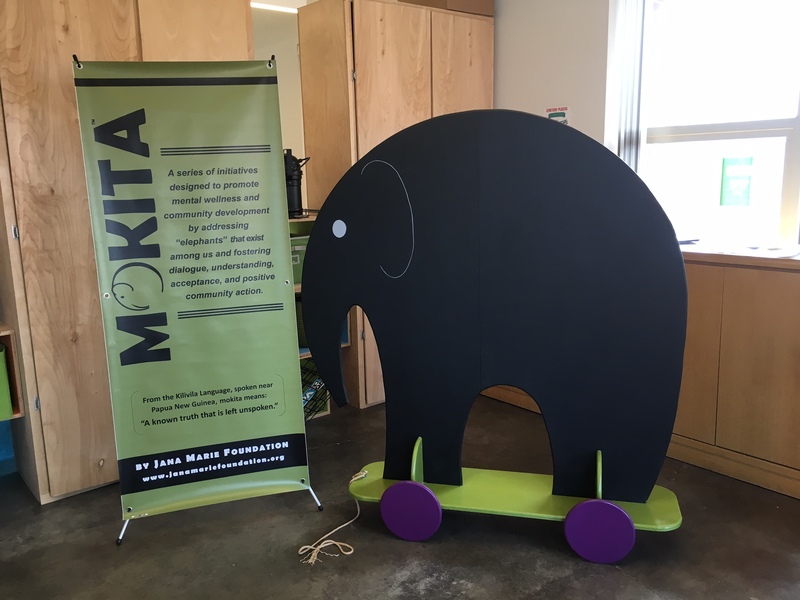 This 5 1/2′ chalkboard elephant provides a place for people to acknowledge their elephants and the healthy ways they cope. 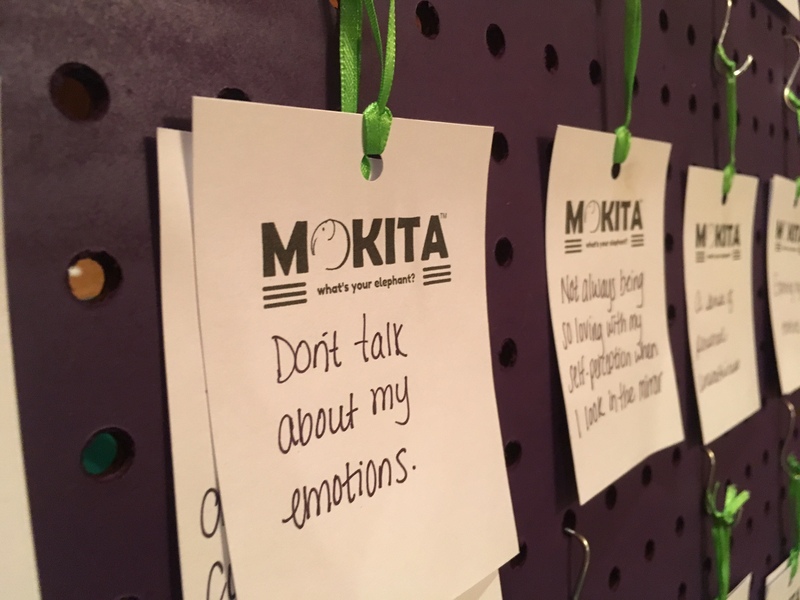 Mo made its first debut out at our Mokita® Dialogue session in February 2017 and has since traveled around to mental health performances and events to help raise awareness and promote dialogue. Everyone has a story. Everyone has an elephant. What’s yours? 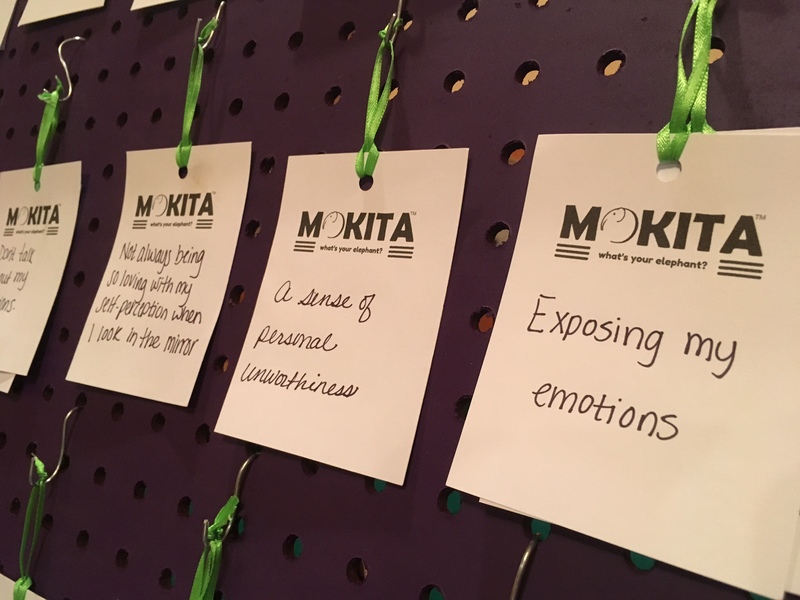 Jana Marie Foundation uses interactive displays, art exhibits and workshops to provide people with a safe space to acknowledge ‘mokitas‘ that exist in their own life, as well as in the community. With our series of discussions, exhibits and interactive displays, the Jana Marie Foundation brings to light topics of social concern that often go unaddressed and sometimes unnoticed. 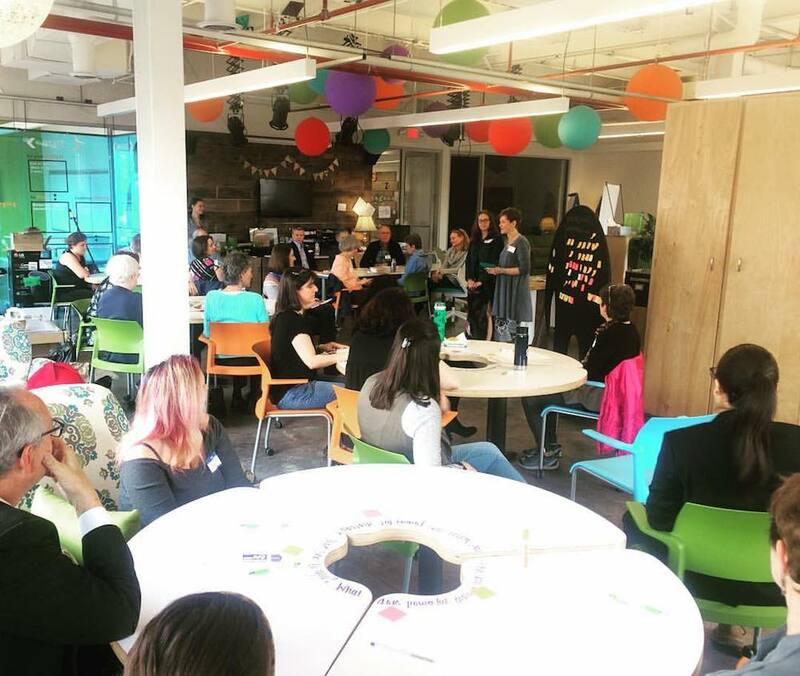 Held the fourth Thursday of every month at New Leaf Initaitive, these brown bag discussions not only highlight topics of vital interest – elephants in the room – but provides opportunities for follow-up and action. 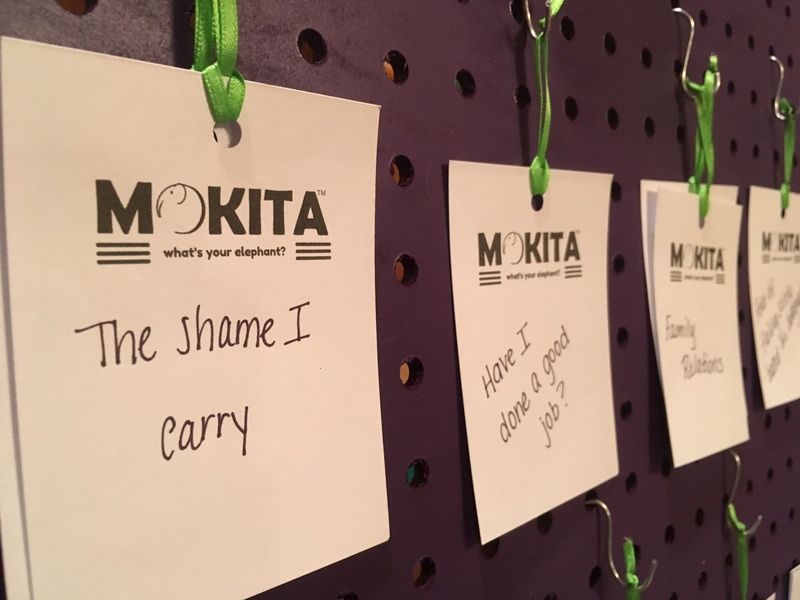 Each Mokita® Dialogue session, led by a different facilitator from through the community, includes a brief presentation, engaging activities that encourage thought and conversation, and suggestions for ways to continue the discussion. Join us to learn, to listen and to be engaged in finding solutions for these important issues. It is time to come together to acknowledge the ‘elephants’ that exist across our community and how we can address them. Poetry is a powerful medium for finding and sharing truths. In this five part series we will look at the ‘elephants’ that exist within ourselves and within the community and have the option to share in a safe class environment and/or in a public reading of original work on the final day. Throughout our time, we’ll explore several types of poetry and poets past and contemporary as we delve deeper into our familiar favorites and gently challenge each other to try something new. We will learn, we will grow, above all, we will strive to have a lot of fun! Please email info@janamariefoundation.org for more details or to enroll in the class. Advanced registration is not required, but much appreciated.